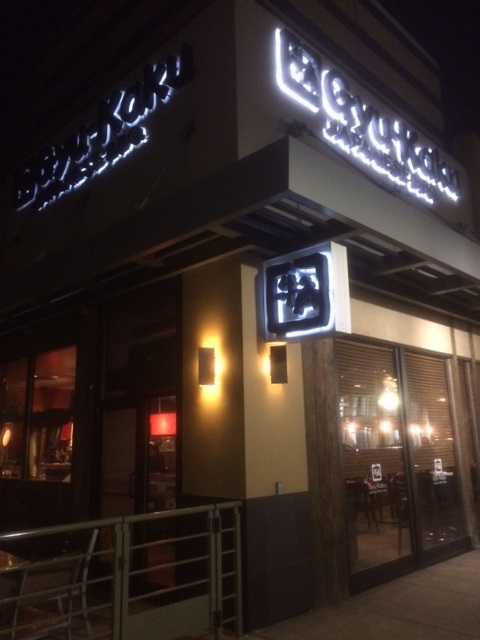 Gyu-Kaku (pronounced “gyew-kah-koo”) is a mainstay of Victoria Gardens, located between JC Penney and Fleming’s Steakhouse on the south end of the outdoor mall. I’ve been there a couple of times over the years but never for my blog. It’s not conducive to solo dining, although that can probably be done. When a Japanese American friend suggested dinner, I thought of Gyu-Kaku. Reservations are generally a good idea here. Another good idea is to go during happy hour, which ends most nights at 6:30 (hours here), because most of the food is $1 off. 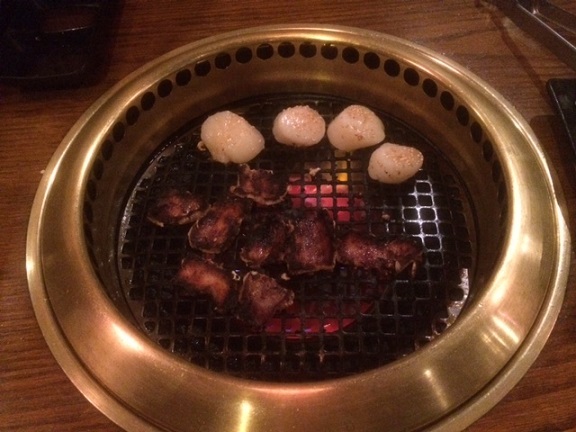 Tables have charcoal grills, much like Korean BBQ restaurants, but here they leave you alone to cook your own food. You order a few meat or vegetable items, or a multi-course fixed-price dinner, and as the items arrive, you get to work. We had prime kalbi short rib, N.Y. steak, shrimp, pork belly, chicken thigh, scallops, asparagus and spinach ($3 to $10 each), enough for a filling meal. Each was delivered with a verbal instruction, such as “five minutes on each side.” My friend set the timer on his cell phone. Tongs are provided. So it’s a little bit of work, and you wonder how much to tip. But it’s also participatory and fun. The food was tasty, with the scallops being our favorite. The only item we didn’t like was the pork belly, possibly due to bum instructions: Five minutes on each side rendered the pieces crispy beyond recognition. The result was like burned bacon. Everything else, though, was spot-on. It was a good outing. “It’s very social,” my friend said approvingly. Also, the restaurant is open late: until 10 p.m. daily and 11 p.m. Fridays and Saturdays. Give it a try. It’s even open on Christmas. Below: wrapped spinach on the grill with shrimp, short ribs and steak waiting; below that, scallops and pork belly. In the Inland Valley, where Korean restaurants are rare, Korean BBQ is the venerable granddaddy of them all. It’s located in a strip mall next to a laundromat along Holt Boulevard. Yes, it’s an unpromising location, but Korean BBQ has been there since sometime around 1990, so it must work for them. It used to have a giant yellow pole sign out front until a makeover to the center required a more modest sign. My friends Meg and K. (of the M-M-M-My Pomona blog) highly recommend the place, and since they used to live in L.A.’s Koreatown neighborhood, their advice was heeded. The three of us met for dinner there on a recent Sunday. The interior is dated, especially the paneling, but it’s clean and pleasant enough, and Korean restaurants generally are utilitarian. The staff brought out the usual array appetizers in small dishes: kimchi, fish cake, bean sprouts, etc. We ordered short ribs ($25) and beef ($18) off the barbecue menu, plus a bowl of bibimbap (forgot the price, sorry) to share. 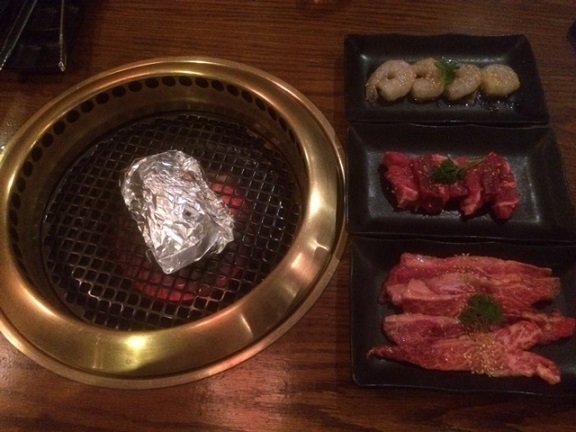 The barbecue items are cooked on a grill in the middle of your table. The staff fires up the grill, puts the meat on and returns to turn it or serve pieces that are done. Korean barbecue is even rarer than Korean restaurants out here; I’ve tried two Korean places in Rancho Cucamonga and one in Chino Hills, and none of them had tabletop barbecue. 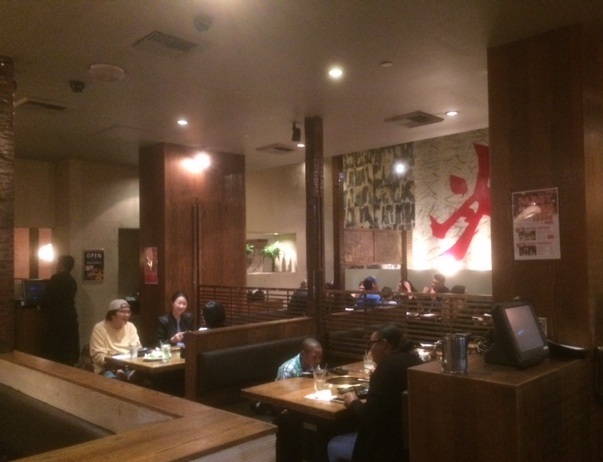 The food in Montclair didn’t impress me as much as my one previous experience with Korean barbecue, at the highly regarded Park’s in L.A. — the meat wasn’t of as high a quality — but I liked the meal, the staff was nice and Montclair is a lot closer than Wilshire Boulevard. The restaurant gets 4 stars on Yelp, where they have the name as Arirang. The menu and sign say Korean BBQ (as did the old sign), but the strip mall’s name is Arirang Plaza, and for all I know that’s the restaurant’s secret name. 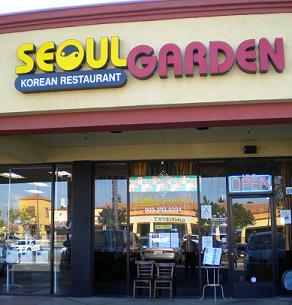 Seoul Garden is in a sort of casual-restaurant row near Indian, Mexican and other ethnic eateries clustered in an outlying building in the Chino Hills Marketplace center. It’s small but makes good use of the limited space, with cheerful yellow walls, a few partitions and exotic decor. A couple of us had lunch there recently. Seoul Garden has various lunch deals, some depending on the day of the week. 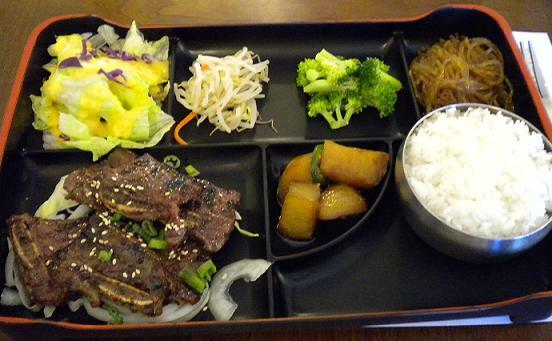 I had the Korean BBQ lunch box ($8.45 on Mondays) and my lunch companion had beef bulgogi ($5.45). 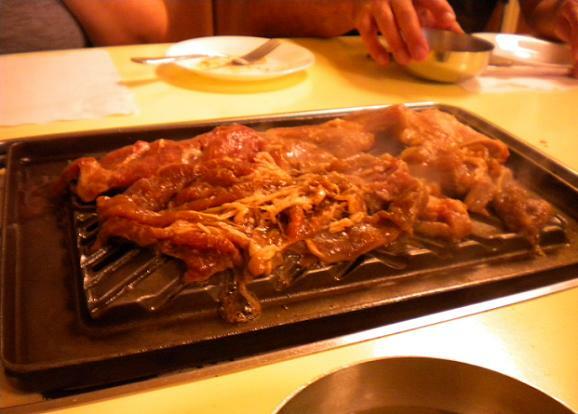 A Korean food first-timer, he found the bulgogi (chopped, marinated beef) tender and very tasty. “I’m going to drag some people here,” he vowed. My short rib lunch was also pretty good. Service was friendly. As Korean food goes, not outstanding like Young Dong Tofu House elsewhere in town, but pleasant. 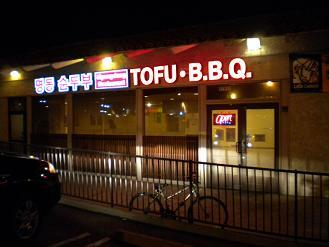 Korean restaurants are relatively rare in the Inland Valley, and the subset of Korean tofu restaurants is even smaller. The only ones I’m aware of are Young Dong in Chino Hills and Myung Dong in Rancho Cucamonga. The latter is in the shopping center where the 99 Ranch market recently opened. Based on the pit area, Myung Dong appears to have taken over a Korean barbecue restaurant. The furnishings aren’t quite up to snuff; merely plopping into a booth rattled the booth back and the customer sitting behind me. I ordered a bibimbap with beef paired with pork tofu soup ($12) and friend got mushroom tofu soup ($9). Bibimbap — assorted vegetables with a meat of your choice, rice on the side — is a basic Korean dish, albeit one I’d never had. 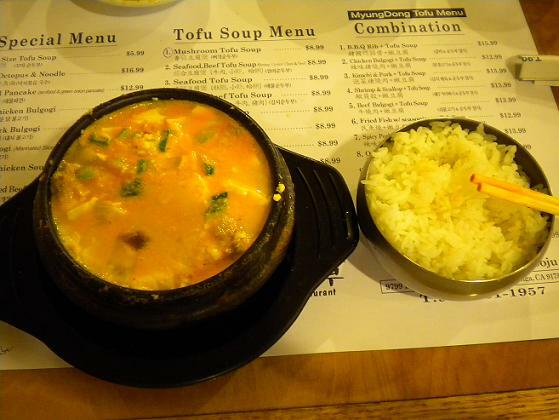 The thick soup, spiked with chunks of tofu, comes in a hot pot and arrived at our table bubbling. Service was helpful. The food was okay if unspectacular. 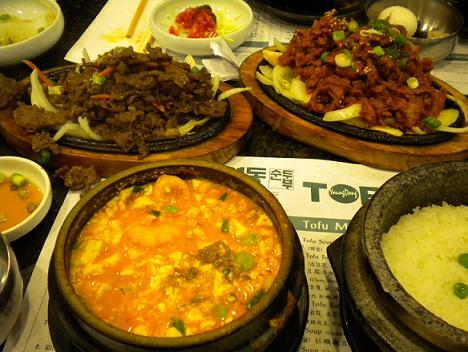 Too much tofu and not enough of the main item (pork or mushroom, in our cases). The spice legend on the menu ranges from four peppers (extra spicy) past mild (one pepper) to white. (I joked that maybe white is for white people.) My friend’s spicy soup (three peppers) wasn’t very spicy; even I could eat it, and I’m sensitive to spiciness. So the food, at least in this one experience, was blander than it should have been. Young Dong was a better experience. 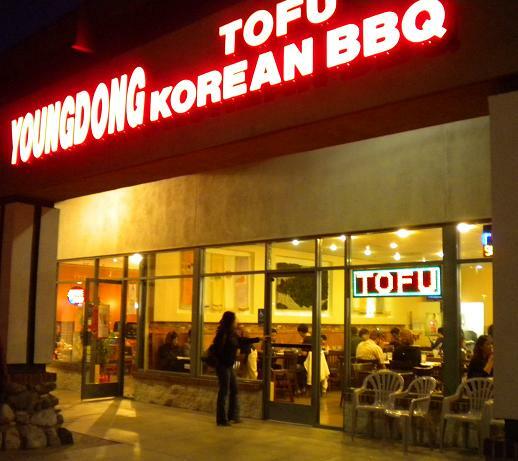 But if you’re closer to Rancho Cucamonga than to Chino Hills, and you’d like to try Korean tofu, Myung Dong is good enough. I would advise against the combinations unless you’re a bigger eater than I am. Either the soup or the bibimbap would be enough for a decent meal, especially with the free appetizers you always get at a Korean restaurant, the small dishes of kimchi, bok choy, potato, cucumber and other items. Yes, it’s a name that could launch a thousand off-color jokes, but forget the name and concentrate on the food. 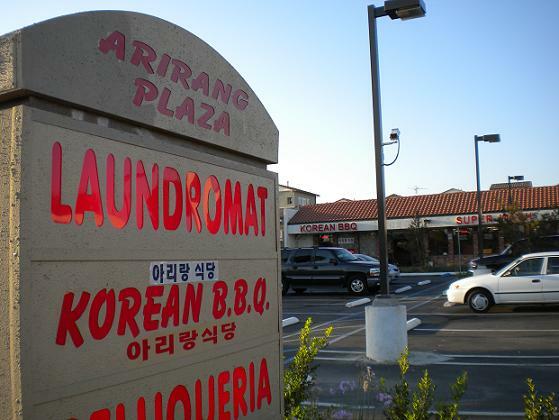 Youngdong has locations in Arcadia and San Gabriel besides this one in a neighborhood shopping center with an Albertsons. The Youngdong exterior is floor to ceiling glass, exposing the food hall atmosphere inside: rows of tables, bright lighting, minimal decor and lots of customers. First they bring out the Korean side dishes: a half-dozen small plates with kimchi, fried pancake, seaweed, etc. Our table of four ordered multiple dishes. Seafood and beef tofu soup, dumpling tofu soup and mushroom tofu soup ($8.83 each) come in bubbling pots, with a stone pot of rice on the side. Once they stopped bubbling, they were quite good, spiced to order (two of us went with medium, one with extra spicy). Spicy pork and BBQ beef ($13.95 each) were plates heaped with the meat in question, sweet and tender. 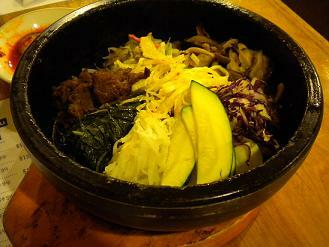 I’ve had Korean food only a few times, so I’m still a neophyte, but we all liked our meals very much and would go back. People on Yelp are excited too.